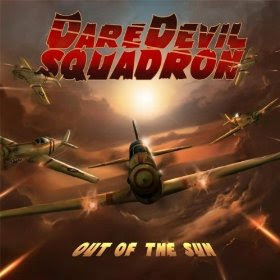 Hall of the Mountain King: Review: DareDevil Squadron, "Out of the Sun"
The members of DareDevil Squadron wear their varied influences on their sleeves on their debut album Out of the Sun, and, to be honest, it’s quite refreshing. 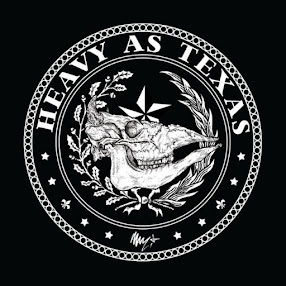 There’s a dash of traditional metal here, a bit of 1970s hard rock there, a pinch of 1980s sleaze, just a touch of blues rock and even an occasional hit of down-South twang here and there, and it all comes together in a fun, high energy effort that’s totally old school, but doesn’t sound dated. Much of what’s found on Out of the Sun may seem a bit out of character for three of the five members – vocalist Andrew Ross, guitarist Angus Clark and bassist Chris Altenhoff – who are perhaps better known for their work with the symphonic rock project Trans-Siberian Orchestra. Though there are shades of that background in places on this record, it’s much more of a stripped-down, raw and rocking affair. The title track sets the tone for the record right out of the gate with a heavy helping of NWOBHM influence and just a shade of Savatage coming on the verses. It’s aggressive, energetic and signals good things. The band locks into a groove on the 1980s hard rocker “Punishment Fits” and then delivers a performance reminiscent of Paul Di’Anno-era Iron Maiden with “Forgotten Son,” which also features an undeniable chorus attack. Fourth track, “Back Lounge,” completes the introduction to the band with an irresistible, purely 1980s sleaze boogie about life on the road that’s lyrically perhaps a little silly but all done in tongue-in-cheek fun. It also offers a nod to where the band was born – during a conversation in the back lounge of a bus sparked by a session of viewing vintage Maiden concerts. From there, DareDevil Squadron begins to explore the hard rock soundscape a little more. “Hero Falls” reminds me of Thin Lizzy’s “Jailbreak” with the start and stop riffing from Clark and fellow guitarist Aurelien Budynek and the half-spoken, half-crooned vocal style that Ross takes on. The most ambitious number on the record may be the protractedly titled “Chronicles of Sorrow Part 1 – An Eternity of Forgetfulness.” Ross breaks out the mandolin on the tune that opens with a Led Zeppelin flavor and casually morphs into a 1970s prog-rock piece. There’s a more metallic rumble toward the middle of the song, but the art rock leanings remain. The song shows the versatility of the band (as if the members’ past work doesn’t), but ultimately, I have to admit I prefer the more straight-up rockers. Two of the best songs come near the end of the album. “Power Trip” brings the funk, opening with a cool wah-wah guitar lick. The song feels a little like Kiss in places, but with superb musicianship (though I will say that the brief rapped bits might not have been the best idea.) That’s followed with the groovy blues rocker, “Faith Hope Love,” which is the smoothest song on the record. There’s a classy bit of ZZ Top’s Billy Gibbons in the guitar sound and coolness drips off Ross’ vocal delivery on the verse. They close the album with a straight-up, no excuses tribute to a major influence with “Lillian.” It’s a pure piece of Thin Lizzy worship that the band members readily cop to. The five members of the band have a diverse background, with stints in hard rock, metal, symphonic rock and even bluegrass outfits. I find it interesting to hear the versatility of Ross here since for the last few years I’ve only really heard him sing huge operatic numbers like “An Angel Came Down” with TSO. Those performances certainly show his talent level, but he’s equally adept at the traditional metal and old school hard rock sounds found here. Clark has certainly also made a fan out of me with his impressive TSO performances, and his role here is perhaps the biggest surprise since I’m used to hearing him play sweeping, majestic passages. Here, he gets a chance to just cut loose on some down and dirty rock, and the results are great. Budynek is no slouch himself, and the team of Altenhoff and drummer Jason Gianni drive the groove of the record. In all honesty, I can’t really find a single bad thing to say about this record, and that’s pretty unusual. I like it from start to finish. At the risk of sounding like the crazy lady on that stupid pest control commercial, it just … makes me happy. It rocks, it’s catchy and it’s fantastic fun. What more can you ask for? Get "Out of the Sun."